I was admiring a fellow Ravely member’s lovely shawl and found this Free pattern: (click to follow link): Ostrich Plume Lace Capelet Pattern by Celia Ng. I’m almost done with Sally Sells Seashells Doily for my dear chat-buddy Sally. She is clueless, I can’t wait to gift this to her! 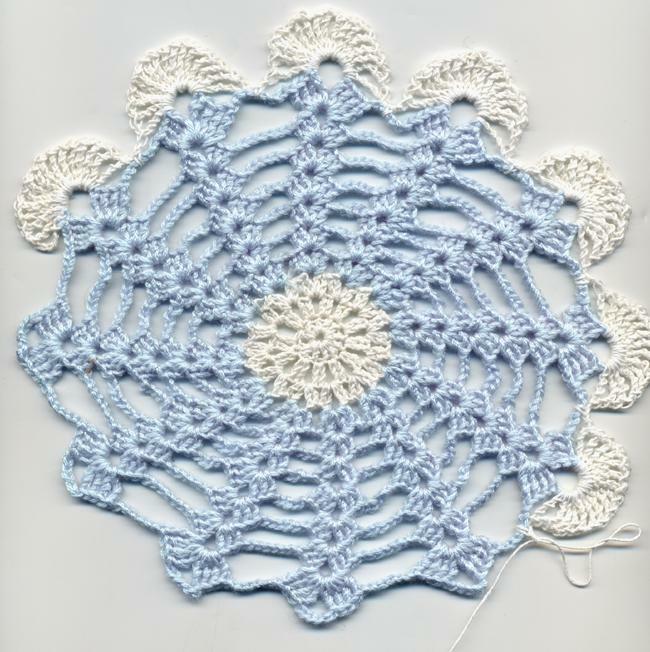 The pattern is from the American Thread Co. Star Doily Book No. 143. I’ve made 4 of these, so far. Tomorrow looks like a good day for finishing up the last of any yard work. I need to trim back the Ornamental Crab in front, while DH tries out his new Echo Leaf Blower on the gutters. The sun promises to shine, and even if not, we’ll be outside for what remains of our fall. We went to the store today and picked up a 12 lb. Jennie-O turkey for next week. DH thinks if the weather is nice, he’ll grill it outside again this year~ there’s nothing like turkey wrapped in bacon on the grill, and a side of Marinated Potato Wedges. I am searching for a knitted lace capelet pattern. You have an Ostrich Plume Pattern, but no directions. How do I get the directions? All I get is a picture of a seashell doily. In the post, mouse over and click on the link within the words: Ostrich Plume Lace Capelet Pattern by Celia Ng. It will take you to her website and the instructions there.